First off – let me apologize for being away for over 2 weeks. Life has been particularly insane since my last post. First, I fell ill with viral cough, cold & fever. Two big packets of Earl Grey tea, a large jar of honey, multiple pots of chicken soup and a bottle of vitamin C supplements later, I finally nursed myself back to health in a week, only to be violently bombarded with the miracle that is Economics Analysis. I’m now moving to the topic of Graduate school. Don’t worry, I’m not going to bore you with the details but oh my #$%@*&^%!!! lord! Like… how am I supposed to study all those complicated graphs and formulae in order for me to get a decent grade and not shame my family, my community and not to mention myself?! In this regard, only God can help (and copious amounts of studying). What I’ve also been struggling with, is trying to make home-cooked meals every day and minimize eating out. I have classes in the evenings, which means I get home way past dinner time. I have to have something ready and prepared for my husband and myself for dinner on nights I have class, so we don’t eat out. Fortunately for me, the skills I learned while managing a household the last 2 years really really help. This is really easy to do when you take a little bit of time to get organized. I have a Google doc. that is a laundry list of all the possible dishes me and my husband like. Every week, I simply refer to that file and randomly choose 6-7 items to prepare that week. Then, I make my grocery list based on the week’s menu. At the grocery store, I only buy what I need. Packs of loaf cake, deals on chips and interesting breads all look tempting but sticking to the grocery list makes sure we eat healthy and minimizes snacking and leftovers. Personally for me, planning a grocery list beforehand helps me to look for coupons as well. If you know your schedule for the next few days is going to be crazy and you’ll get home starving and ready to eat almost anything, make 2-3 dishes at a go when you have the time to avoid eating out. Again, having a menu and the necessary groceries help you to prepare a few dishes in under 2 hours. – Stock up on ’emergency’ food items like canned low-sodium soups, shaved turkey breast and whole grain bread to make a quick soup and sandwich meal just in case you don’t have anything prepared. – Store foods like ready cut Tilapia fish that cooks in only 10-15 minutes. Serve with a salad. – Partially prepare a lentil like yellow or black lentil in the pressure cooker. It helps you whip up a quick dal in under 20 minutes. Boil any lentil in the pressure cooker until fully cooked and store in airtight containers. Then, when you’re pressed for time, simply follow the recipe like in this earlier post. While the dal is being prepared, cook some rice in a rice cooker, or serve the dal with store-bought frozen parathas. And now to the recipe for Butternut Squash ‘sabzi’. As I’ve mentioned in earlier posts, a sabzi is a generic Hindi word for any vegetable preparation that is eaten with Rotis or Parathas (Indian flatbread). The Buttternut Squash is not available in India, but my sister, who is much more of an experimental cook than I am, prepared the vegetable in an Indian style. I have used her recipe to make this dish. The result is a really yummy, sweet-n-spicy dish that goes really well with Indian flatbread and as a side with the humble dal-chawal alike. Pre-heat the oven to 400 degrees F. Line a large cookie sheet with aluminum foil. 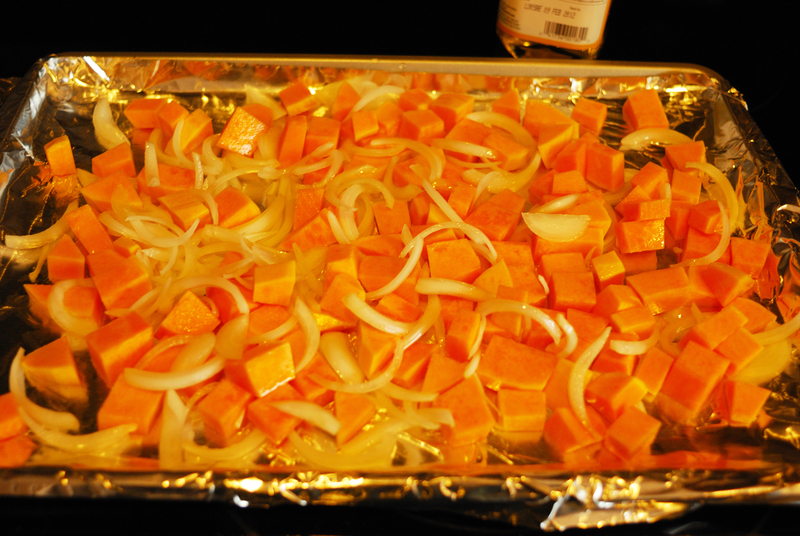 Place the Butternut squash cubes with the sliced onions in it. Drizzle with 2 tbsp olive oil and toss with your hands. Bake for 35-45 minutes or until the squash is cooked through and lightly crunchy on the outside and the onions are caramelized. Prepare the spice mix in the mean time: mix the chili, turmeric, cumin, coriander and amchur powders in a bowl. What a fabulous idea! 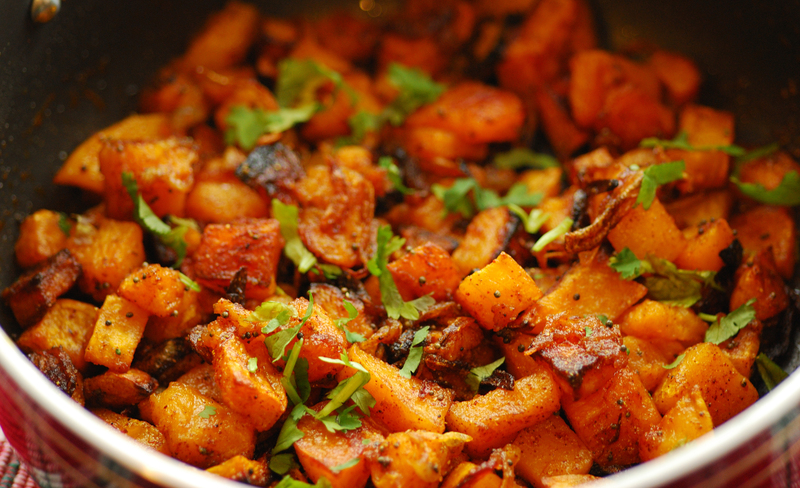 Replacing potatoes with butternut squash is an awesome substitution, and healthier too. Thanks for the lovely recipe my friend! And the tips. I’m glad that you are finally feeling better! Glad you like the recipe Ameena. Yes moving to healthier Indian recipes is quite the quest I’m on. I’m happy that moms like you appreciate the tips. 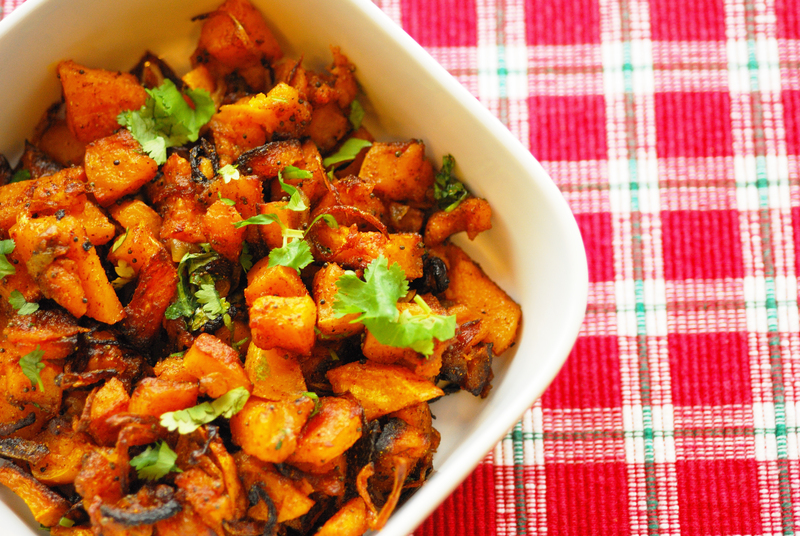 This looks amazing – you know how I love butternut squash! I made a mexican version of the same kind of thing – squash roasted with oil, garlic & chipotle puree, and we eat that with tortillas…but I’m definitely going to have to try this version soon! A beautiful blog and a spirited blogger. This my first visit to your blog and I must say I love it. I love the enthusiasm, the spirit of adventure that exudes from each of your post. So glad you found my blog and enjoy it, Anita 🙂 You have quite a spunky blog yourself! Can’t wait to spend more time on it. Hope to see you around here again! I’ve been following your blog for quite some time. As has been for several food blogs, Farida Harianawala told me about your blog too. I totally and absolutely relate to your post. I graduate in three weeks from my program. And for the last 2 years – I’ve planned my meals the way you mentioned. Prepare the menu on Friday or Saturday, do the grocery, and cook on Sunday afternoon. What I’ve noticed is cooking 5-6 dishes is fairly quick if you plan out your cooking and chop common things like onions, ginger, etc for all dishes at once. It’s healthy too. And after a long day of work and school, all you want is food when you are home!! It’s during finals week that either the hubby does stuff or we rely on good ol’ frozen food from the store! And quarter/ semester breaks are times for me to experiment with foods that need elaborate prep work or are time consuming. Some great tips there.I am pretty bad at planning meals so no matter how much effort I put I am thown off the gear at the last moment 🙂 Your sabzi looks yum.I am nt a big fan of butternut-find it sweet but wud love to try your way with some other squash. Enjoyed your post and all those ideas are perfect . In fact when I was in bangalore, before I got married and move to US and took the role of a homemaker, I used to cook alternate days and certain weeks I used to cook only twice but it used to be enough to feed me the whole week. Some weeks I used to cook half and then just before serving myself I would do a retouch and voila !! Glad to find your blog and stay warm. May I know if I can omit the Amchur? Will it have a big effect on the taste? I’m not sure if I can find it here. Yes, you can omit the aamchur and the only taste that’ll get left out is it’s tangy flavor. Thank you for stopping by and your questions, Wendy! Thank you. I’ll let you know if I made this and got it posted. thank you very much. I made this twice for some guests and both times got rave reviews. 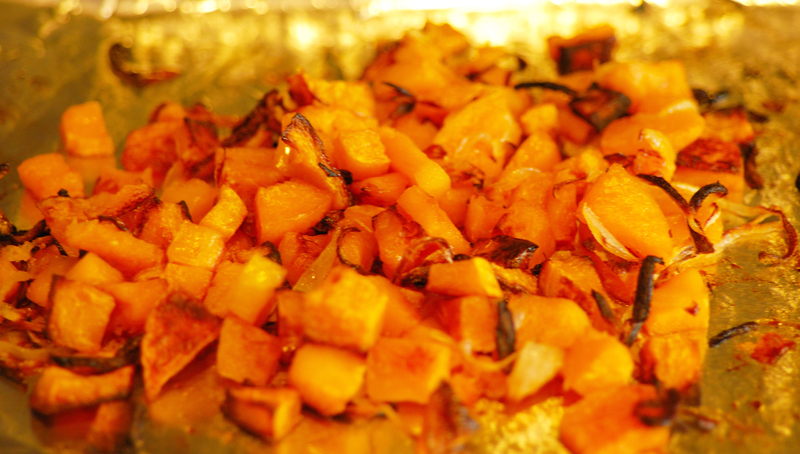 The roasting of onions together with the pumpkin makes it very very delish! Love the caramelized flavour. I wasn’t in the mood for butternut squash soup, so I searched the internet, found and made this dish. Excellent. Thank you. Tried the recipe to surprise my husband… He loved it! i have been wanting to try new vegetables apart from the usual beans, etc… It is gonna be my new party favorite! Thanks a ton! Loved your blog.. So what can I replace amchur powder with if I can’t find it in my local speciality store? loved your article 😊😊 where do you get those in India? and, what do you call them here ? ?